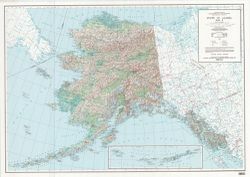 Large Topographic Alaska Map that focuses on physical features. It shows the terrain with shaded relief, mountains, rivers, lakes as well as the cities and towns. Makes a great wall map of Alaska - paper or laminated.